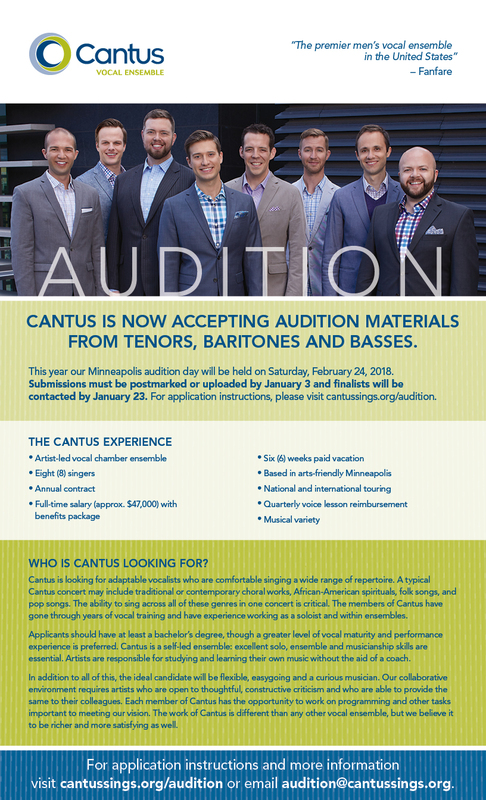 Cantus is currently accepting audition materials from tenors, baritones, and basses interested in joining the ensemble. As a member of the eight-voice, artist-led vocal chamber ensemble, you are provided with an annual 52-week contract, full-time salary with benefits, quarterly voice lesson reimbursement, and six weeks of vacation. In the 2018–19 season our artists made $47,000. 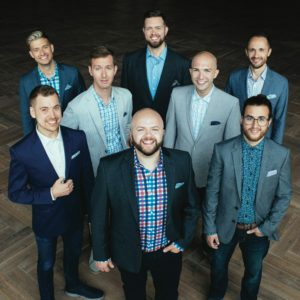 Based in arts-friendly Minneapolis, MN, Cantus tours an average of 13 weeks a year, performs an expansive home concert series of five different subscription series, and has an active schedule of education outreach both in the Twin Cities and across the country. Applications must be mailed or submitted electronically by January 7, 2019. Finalists selected for a live audition will be notified by January 18, 2018. To view this year’s audition email, please click here. Three (3) solo repertoire selections. At least one must be an aria, and one must be in a language other than English. Selections should contrast in style (aria, art song, musical theater, gospel, jazz, pop). Please write auditions@cantussings.org if you have any further questions. We look forward to your submission!